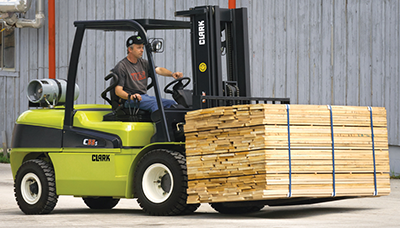 The C40-55s pneumatic tire forklift delivers smooth and powerful performance. The diesel or LPG engine, fully automatic three-speed transmission, and wet disc brakes create the optimal lift truck for manufacturing, warehousing, lumber and building materials handling where there are rough floor conditions. Maximum horsepower uses a load-sensing flow control valve to reduce heat build-up. Main hydraulic valve incorporates adjustable flow controls for tilt and auxiliary functions for optimum performance of attachments. The sectional design allows for easy addition of extra functions and simplified service. Upright mounted load lowering valve controls lowering independent of engine speed. Rails are designed to be 55% stiffer than conventional flat-faced rails. Hydraulic cushioning valves silent staging reduces shock and vibration. The shimmable, sealed and canted load rollers come with 6 load rollers and 4 side thrust rollers that maximize load distribution and reduce free play. Minimal wear promotes long life and reduced maintenance means less downtime. The operator presence sensing system is an added safety feature by disengaging the hydraulic and transmission function when operator leaves the seat. CLARK vinyl safety seat is adjustable, molded for support, comes with a non-cinching, retractable seat belt and has standard weight adjustment and full suspension. The low cowl design greatly increases visibility of forks and load. The tilt steering column adjusts to suit the operator and provides easier entry and exit from operator’s compartment.